Ferdinando I (1587-1609) continued his father's policy and succeeded in strengthening the grand duchy, maintaining a difficult equilibrium between France and Spain. Signs of decadence became more obvious under the government of these two sons of Cosimo I's and were accellerated in the 17th century. Florence was still a great city, but its territory was small and it could certainly not compete with the great and powerful centralized states. Economically the situation had also changed. Trade and manufacturing were on the decline and, at least up to the end of the 16th century, only banking was still carried out on a European level, but in the end that too declined. The efforts of the grand ducal governments to give new life to business by developing the port of Livorno and the founding of the military order of Saint Stephen for the protection of the Florentine navy from the "barbareschi" were to no avail. On the contrary agriculture grew in importance in Tuscany and in the second half of the 16th century large reclamation projects were undertaken in various parts of the region. Ferdinando I was succeeded by the "weak and sickly" Cosimo II (1609-1621) who died leaving the government in the hands of his wife Maria Magdalena of Austria and his mother Christine of Lorraine. In 1628, when the period of the regency came to an end, Ferdinando II mounted the throne and reigned until 1670. Even though he was reputed to be "among the best of the Medici dynasty", he could do nothing to arrest the inexorable decline of Florence and of the Tuscany of the grand dukes. Nor could his successors, Cosimo III (1670-1723) and the last of the Medici dynasty, Gian Gastone, who died without heirs in 1737. 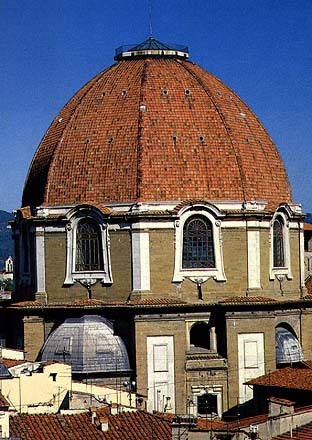 Even so, as far as culture was concerned, the city, by now condemned to a provincial role, still displayed a certain vitality which expressed itself in the field of music (melodramma, with the famous "Camerata di casa Bardi", was born in Florence at the end of the 16th century) and in the phenomenon of the Academies. From the late 16th century on and throughout the 17th century numerous academies of pure literature came into being. The Accademia della Crusca whose principal labor was the compilation of the Dictionary, the first edition of which appeared in 1612, was founded in 1582. Of great importance for the sciences was the activity of the Accademia del Cimento, founded by Leopoldo de' Medici in 1657 and sustained by his brother, the reigning Ferdinando II. Both were pupils of Galileo, the only man of genius the 17th century produced in the grand duchy.